"And do not account the saying to be rash. For the Lord is loving to man, and the gift cometh of His goodness. It is rash to have a mouth like the devil, to have a tongue resembling that of an evil demon, especially for him that partakes of such mysteries, and communicates of the very flesh of the Lord. Reflecting then on these things, become like Him, to the utmost of thy power. No longer then will the devil be able so much as to look thee in the face, when thou art become such a one as this. For indeed he recognizes the image of the King, he knows the weapons of Christ, whereby he was worsted. And what are these? Gentleness and meekness. For when on the mountain Christ overthrew and laid low the devil who was assaulting him, it was not by making it known that He was Christ, but He entrapped him by these sayings, He took him by gentleness, he turned him to flight by meekness. Thou also must do this; shouldest thou see a man become a devil, and coming against thee, even so do thou likewise overcome. Christ gave thee also power to become like Him, so far as thy ability extends. Be not afraid at hearing this. The fear is not to be like Him. Speak then after His manner, and thou art become in this respect such as He, so far as it is possible for one who is a man to become so. Wherefore greater is he that thus speaks, than he that prophecies. For this is entirely a gift, but in the other is also thy labor and toil. Teach thy soul to frame thee a mouth like to Christ’s mouth. For it can create such things, if it will; it knows the art, if it be not remiss. And how is such a mouth made? one may ask. By what kind of colorings? by what kind of material? By no colorings, indeed, or material; but by virtue only, and meekness, and humility. Let us see also how a devil’s mouth is made; that we may never frame that. How then is it made? By curses, by insults, by envy, by perjury. For when any one speaks his words, he takes his tongue. What kind of excuse then shall we have; or rather, what manner of punishment shall we not undergo; when this our tongue, wherewith we are allowed to taste of the Lord’s flesh, when this, I say, we overlook, speaking the devil’s words? Let us not overlook it, but let us use all diligence, in order to train it to imitate its Lord. For if we train it to this, it will place us with great confidence at Christ’s judgment seat. Unless any one know how to speak thus, the judge will not so much as hear him. For like as when the judge chances to be a Roman, he will not hear the defense of one who knows not how to speak thus; so likewise Christ, unless thou speak after His fashion, will not hear thee, nor give heed. Let us learn therefore to speak in such wise as our Judge is wont to hear; let it be 456our endeavor to imitate that tongue. And shouldest thou fall into grief, take heed lest the tyranny of despondency pervert thy tongue, but that thou speak like Christ. For He too mourned for Lazarus and Judas. Shouldest thou fall into fear, seek again to speak even as He. For He Himself fell into fear for thy sake, with regard to His manhood. the other sheep, that He might indicate the unfruitfulness of the one, for no fruit will come from kids; and the great profit from the other, for indeed from sheep great is the profit, as well from the milk, as from the wool, and from the young, of all which things the kid is destitute. But while the brutes have from nature their unfruitfulness, and fruitfulness, these have it from choice, wherefore some are punished, and the others crowned. And He doth not punish them, until He hath pleaded with them; wherefore also, when He hath put them in their place, He mentions the charges against them. And they speak with meekness, but they have no advantage from it now; and very reasonably, because they passed by a work so much to be desired. For indeed the prophets are everywhere saying this, “I will have mercy and not sacrifice,” and the lawgiver by all means urged them to this, both by words, and by works; and nature herself taught it. But mark them, how they are destitute not of one or two things only, but of all. For not only did they fail to feed the hungry, or clothe the naked; but not even did they visit the sick, which was an easier thing. And mark how easy are His injunctions. He said not, “I was in prison, and ye set me free; I was sick, and ye raised me up again;” but, “ye visited me,” and, “ye came unto me.” And neither in hunger is the thing commanded grievous. For no costly table did He seek, but what is needful only, and His necessary food, and He sought in a suppliant’s garb, so that all things were enough to bring punishment on them; the easiness of the request, for it was bread; the pitiable character of Him that requesteth, for He was poor; the sympathy of nature, for He was a man; the desirableness of the promise, for He promised a kingdom; the fearfulness of the punishment, for He threatened hell. The dignity of the one receiving, for it was God, who was receiving by the poor; the surpassing nature of the honor, that He vouchsafed to condescend so far; His just claim for what they bestowed, for of His own was He receiving. But against all these things covetousness once for all blinded them that were seized by it; and this though so great a threat was set against it. What sayest Thou? they are Thy brethren; and how dost Thou call them least. Why, for this reason they are brethren, because they are lowly, because they are poor, because they are outcast. For such doth He most invite to brotherhood, the unknown, the contemptible, not meaning by these the monks only, and them that have occupied the mountains, but every believer; though he be a secular person, yet if he be hungry, and famishing, and naked, and a stranger, His will is he should have the benefit of all this care. For baptism renders a man a brother, and the partaking of the divine mysteries. 2. Then, in order that thou mayest see in another way also the justice of the sentence, He first praises them that have done right, and saith, “Come, ye blessed of my Father, inherit the kingdom prepared for you before 457the foundation of the world. For I was an hungered, and ye gave me meat,” and all that follows. For that they may not say, we had it not, He condemns them by their fellow-servants; like as the virgins by the virgins, and the servant that was drunken and gluttonous by the faithful servant, and him that buried his talent, by them that brought the two, and each one of them that continue in sin, by them that have done right. And here, however, it is of an equal; for he compares rich with rich, and poor with poor. And not in this way only doth He show the sentence justly passed, by their fellow-servants having done what was right when in the same circumstances, but also by their not being obedient so much as in these things in which poverty was no hindrance; as, for instance, in giving drink to the thirsty, in looking upon him that is in bonds, in visiting the sick. And when He had commended them that had done right, He shows how great was originally His bond of love towards them. For, “Come,” saith He, “ye blessed of my Father, inherit the kingdom prepared for you from the foundation of the world.” To how many good things is this same equivalent, to be blessed, and blessed of the Father? And wherefore were they counted worthy of such great honors? What is the cause? “I was an hungered, and ye gave me meat; I was thirsty, and ye gave me drink;” and what follows. Of what honor, of what blessedness are these words? And He said not, Take, but, “Inherit,” as one’s own, as your Father’s, as yours, as due to you from the first. For, before you were, saith He, these things had been prepared, and made ready for you, forasmuch as I knew you would be such as you are. But to the others He saith, “Depart from me, ye cursed,” (no longer of the Father; for not He laid the curse upon them, but their own works), “into the everlasting fire, prepared,” not for you, but “for the devil and his angels.” For concerning the kingdom indeed, when He had said, “Come, inherit the kingdom,” He added, “prepared for you before the foundation of the world;” but concerning the fire, no longer so, but, “prepared for the devil.” I, saith He, prepared the kingdom for you, but the fire no more for you, but “for the devil and his angels;” but since ye cast yourselves therein, impute it to yourselves. And not in this way only, but by what follows also, like as though He were excusing Himself to them, He sets forth the causes. “For I was an hungered, and ye gave me no meat.” For though He that came to thee had been thine enemy, were not His sufferings enough to have overcome and subdued even the merciless? hunger, and cold, and bonds, and nakedness, and sickness, and to wander everywhere houseless? These things are sufficient even to destroy enmity. But ye did not these things even to a friend, being at once friend, and benefactor, and Lord. Though it be a dog we see hungry, often we are overcome; and though we behold a wild beast, we are subdued; but seeing the Lord, art thou not subdued? And wherein are these things worthy of defense? For if it were this only, were it not sufficient for a recompense? (I speak not of hearing such a voice, in the presence of the world, from Him that sitteth on the Father’s throne, and of obtaining the kingdom), but were not the very doing it sufficient for a reward? But now even in the presence of the world, and at the appearing of that unspeakable glory, He proclaims and crowns thee, and acknowledges thee as His sustainer and host, and is not ashamed of saying such things, that He may make the crown brighter for thee. So for this cause, while the one are punished justly, the others are crowned by grace. For though they had done ten thousand 458things, the munificence were of grace, that in return for services so small and cheap, such a heaven, and a kingdom, and so great honor, should be given them." For the matter indeed of John’s disciples had been ordered well, and they were gone away assured by the miracles which had just been performed; but there was need after that of remedy as regarded the people. For although they could not suspect anything of the kind of their own master, the common people might from the inquiry of John’s disciples form many strange suspicions, not knowing the mind with which he sent his disciples. And it was natural for them to reason with themselves, and say, “He that bore such abundant witness, hath he now changed his persuasion, and doth he doubt whether this or another be He that should come? Can it be, that in dissension with Jesus he saith this? that the prison hath made him more timid? that his former words were spoken vainly, and at random?” It being then natural for them to suspect many such things, see how He corrects their weakness, and removes these their suspicions. For “as they departed, He began to say to the multitudes.” Why, “as they departed?” That He might not seem to be flattering the man. And in correcting the people, He doth not publish their suspicion, but adds only the solution of the thoughts that were mentally disturbing them: signifying that He knew the secrets of all men. For He saith not, as unto the Jews, “Wherefore think ye evil?”(Matt. ix. 4.) Because if they had it in their minds, not of wickedness did they so reason, but of ignorance on the points that had been spoken of. Wherefore neither doth He discourse unto them in the way of rebuke, but merely sets right their understanding, and defends John, and signifies that he is not fallen away from his former opinion, neither is he changed, not being at all a man easily swayed and fickle, but steadfast and sure, and far from being such as to betray the things committed unto him. Wherefore He saith, “What went ye out into the wilderness to see?” as though He had said, Wherefore did ye leave your cities, and your houses, and come together all of you into the wilderness? To see a pitiful and flexible kind of person? Nay, this were out of all reason, this is not what is indicated by that earnestness, and the concourse of all men unto the wilderness. So much people and so many cities would not have poured themselves out with so great zeal towards the wilderness and the river Jordan at that time, had ye not expected to see some great and marvellous one, one firmer than any rock. Yea, it was not “a reed” surely, that “ye went out to see shaken by the wind:” for the flexible and such as are lightly brought round, and now say one thing, now another, and stand firm in nothing, are most like that. And see how He omits all wickedness, and mentions this, which then especially haunted (ὑφορμοσαν) them; and removes the suspicion of lightness. Now His meaning is like this: He was not of himself a waverer; and this ye yourselves showed by your earnestness. Much less could any one say this, that he was indeed firm, but having made himself a slave to luxury, he afterwards became languid. For among men, some are such as they are of themselves, others become so; for instance, one man is passionate by nature, and another from having fallen into a long illness gets this infirmity. Again, some men are flexible and fickle by nature, while others become so by being slaves to luxury, and by living effeminately. “But John,” saith He, “neither was such a character by nature, for neither was it a reed that ye went out to see; nor by giving himself to luxury did he lose the advantage he possessed.” For that he did not make himself a slave to luxury, his garb shows, and the wilderness, and the prison. Since, had he been minded to wear soft raiment, he would not have lived in the wilderness, nor in the prison, but in the king’s courts: it being in his power, merely by keeping silence, to have enjoyed honor without limit. For since Herod so reverenced him, even when he had rebuked him, and was in chains, much more would he have courted him, had he held his peace. You see, he had indeed given proof of his firmness and fortitude; and how could he justly incur suspicions of that kind? 2. When therefore as well by the place, as by his garments, and by their concourse unto Him, He had delineated his character, He proceeds to bring in the prophet. For having said, “Why went ye out? To see a prophet? Yea I say unto you, and more than a prophet;” (Matt. xi. 9.) He goes on, “For this is he of whom it is written, (See Mal. iii. 1.) Behold, I send my messenger before Thy face, which shall prepare Thy way before Thee.” (Matt. xi. 10.) Having before set down the testimony of the Jews, He then applies that of the prophets; or rather, He puts in the first place the sentence of the Jews, which must have been a very strong demonstration, the witness being borne by his enemies; secondly, the man’s life; thirdly, His own judgment; fourthly, the prophet; by all means stopping their mouths. Then lest they should say, “But what if at that time indeed he were such an one, but now is changed?” He added also what follows; his garments, his prison, and together with these the prophecy. 3. But lest the exceeding greatness of His praises should produce a sort of extravagant feeling, the Jews honoring John above Christ; mark how He corrects this also. For as the things which edified His own disciples did harm to the multitudes, they supposing Him an easy kind of person; so again the remedies employed for the multitudes might have proved more mischievous, they deriving from Christ’s words a more reverential opinion of John than of Himself. Wherefore this also, in an unsuspected way, He corrects by saying, “He that is less, in the kingdom of Heaven is greater than he.” Less in age, and according to the opinion of the multitude, since they even called Him “a gluttonous man and a winebibber;” (Matt. xi. 19.) and, “Is not this the carpenter’s son?” (Matt. xiii. 55.) and on every occasion they used to make light of Him. “What then?” it may be said, “is it by comparison that He is greater than John?” Far from it. For neither when John saith, “He is mightier than I,” (Matt. iii. 11. )doth he say it as comparing them; nor Paul, when remembering Moses he writes, “For this man was counted worthy of more glory than Moses,” (Heb. iii. 3.) doth he so write by way of comparison; and He Himself too, in saying, “Behold, a greater than 240 Solomon is here,” (Matt. xii. 42.) speaks not as making a comparison. Now some affirm, that Christ said this of the apostles, others again, of angels. Thus, when any have turned aside from the truth, they are wont to wander many ways. For what sort of connexion hath it, to speak either of angels or of apostles? And besides, if He were speaking of the apostles, what hindered his bringing them forward by name? whereas, when He is speaking of Himself, He naturally conceals His person, because of the still prevailing suspicion, and that He may not seem to say anything great of Himself; yea, and we often find Him doing so. But what is, “In the kingdom of heaven?” Among spiritual beings, and all them that are in heaven. And moreover His saying, “There hath not risen among them that are born of women a greater than John,” suited one contrasting John with Himself, and thus tacitly excepting Himself. For though He too were born of a woman, yet not as John, for He was not a mere man, neither was He born in like manner as a man, but by a strange and wondrous kind of birth. For the prophets would not have ceased, unless I were come. Expect therefore nothing further, neither wait for any one else. For that I am He is manifest both from the prophets ceasing, and from those that every day “take by force” the faith that is in me. For so manifest is it and certain, that many even take it by force. Why, who hath so taken it? tell me. All who approach it with earnestness of mind. Now He used so many dark sayings, to stir them up to inquiry. And if not even so were they awakened, much more, had all been plain and clear. For this surely no man could say, that they dared not ask Him, and that He was difficult of approach. For they that were asking him questions, and tempting Him about common matters, and whose mouths were stopped a thousand times, yet they did not withdraw from Him; how should they but have inquired of Him, and besought Him touching the indispensable things, had they indeed been desirous to learn? For if concerning the matters of the law they asked, “Which is the first commandment,” and all such questions, although there was of course no need of His telling them that; how should they but ask the meaning of what He Himself said, for which also He was bound to give account in His answers? And especially when it was He Himself that was encouraging and drawing them on to do this. For by saying, “The violent take it by force,” He stirs them up to earnestness of mind; and by saying, “He that hath ears to hear, let him hear,” He doth just the same thing. Who in reality remains unmoved when he hears of his life? He astonished the whole city with his enthusiasm, with the purity of his thoughts and his fiery faith, with his self-denial and sacrifice. He was a priest from the region of Tripoli. His pious parents, Nicholas and Alexandra, raised him with care and education in the Lord, leading him to perfect measures of virtue. When he was ordained a priest, he taught the pious people of the area, others he instructed to not be unjust to the poor. Someone from the city named Seletos, committed daily injustices. To him, truly righteous priest Lazarus constantly advised to not be unjust to others. 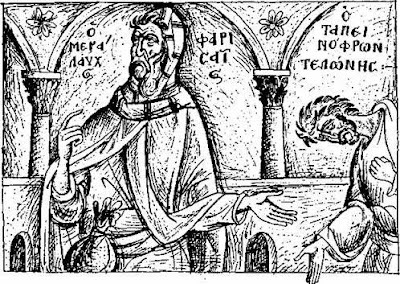 When Seletos was condemned to death for the crimes he had done, he denied Christ to escape punishment. Then, having become a muslem and escaped danger, with the other Turks he desired to seize St. Lazarus and to make him convert. They slandered him many times and led him to the place of judgment, telling him that if he would convert, they would give him many good things, and otherwise, they would kill him. The Saint denied the evil offer of the faithless, who decided to torture him in many ways common to the other neomartyrs, such as beatings, disfiguring limbs, cutting off body parts, injuries and many other things. In the end, seeing the unyieldingness of the martyr, they threw him into the fire, where the Saint surrendered his blessed soul in prayer. It is worthy to note that his mother strengthened him, telling him to endure the temporary pain of the fire, that he might inherit the eternal Kingdom and rejoice with the other martyrs, the angels, archangels, prophets, and all of the Saints. 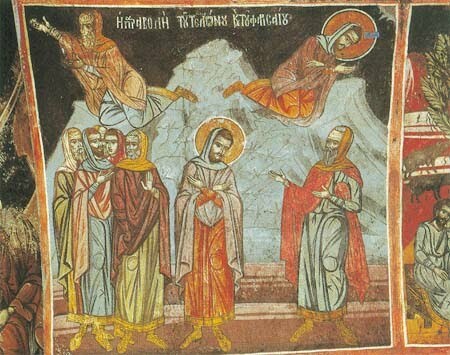 In this way the holy new hieromartyr Lazarus completed his life. As for those faithful and unfaithful standing by, they were astonished, and with fear confirmed how light from heaven shone at the place of martyrdom of the Saint for three days straight. Later, some pious Christians collected the relics and the rope of the Saint, which heal those who call upon the Saint in faith. 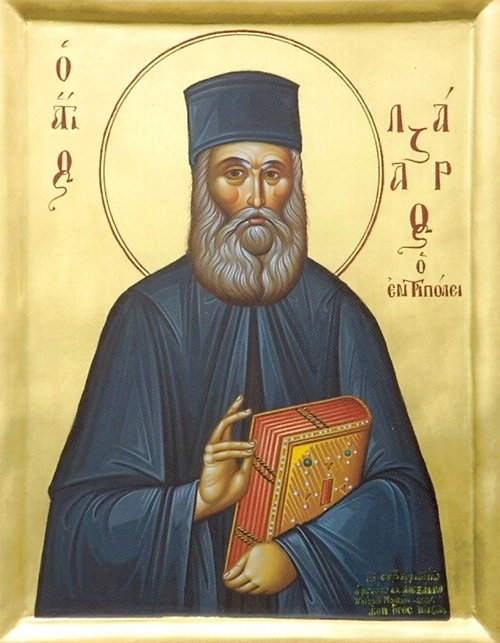 Righteous-athlete and martyr of the Most-High, O Lazarus, who quenched the fire of the furnace with streams of your precious tears, in this last days, as the bright light of Mantineias, and the super-bright lamp of Tripoli, and he seek your grace, we who are burning with the fire of passions. From the dogmas of your words, O Lazarus, utterly conquer those against us, for rule was give to you by God, and you confirm the faith in all things, for he was truly the support. Hail O wondrous righteous-athlete, who in Tripoli quenched fire precipitously and the faithless were crowned with shame by your steadfastness, O boast of martyrs, Lazarus. An [Elder] was asked, "What is humility?" and he said in reply, "Humility is a great work, and a work of God. The way of humility is to undertake bodily labour and believe yourself a sinner and make yourself subject to all." Then a brother said, "What does it mean, to be subject to all?" The [Elder] answered, "To be subject to all is not to give your attention to the sins of others but always to give your attention to your own sins and to pray without ceasing to God." An [Elder] said, "Every time a thought of superiority or vanity moves you, examine your conscience to see if you have kept all the commandments, whether you love your enemies, whether you consider yourself to be an unprofitable servant and the greatest sinner of all. Even so, do not pretend to great ideas as though you were perfectly right, for that thought destroys everything." The [Elders] used to say, "When we do not experience warfare, we ought so much the more to humiliate ourselves. For God seeing our weakness, protects us; when we glorify ourselves, he withdraws his protection and we are lost." "...true humility does not say humble words, nor does it assume humble looks, it does not force oneself either to think humbly of oneself, or to abuse oneself in self-belittlement. Although all such things are the beginning, the manifestations and the various aspects of humility, humility itself is grace, given from above. There are two kinds of humility, as the holy fathers teach: to deem oneself the lowest of all beings and to ascribe to God all one's good actions. The first is the beginning, the second the end." "...we have never achieved anything good on our own, but all good things are ours from God by grace, and come as it were from nothingness into being. For 'what do you have which you did not receive?' asks St. Paul - receive, that is, freely from God; 'and if you received it, why do you boast as if you had not received it' (I Cor. 4:7), but had achieved it by yourself? Yet by yourself you cannot achieve anything, for the Lord has said: 'Without Me, you can do nothing' (John 15:5)." 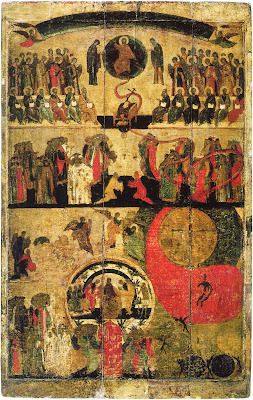 "A characteristic of those who are still progressing in blessed mourning is temperance and silence of the lips; and of those who have made progress – freedom from anger and patient endurance of injuries; and of the perfect – humility, thirst for dishonors, voluntary craving for involuntary afflictions, non- condemnation of sinners, compassion even beyond one’s strength. The first are acceptable, the second laudable; but blessed are those who hunger for hardship and thirst for dishonor, for they shall be filled with the food whereof there can be no satiety." "A man who is truly humble is not troubled when he is wronged and he says nothing to justify himself against the injustice, but he accepts slander as truth; he does not attempt to persuade men that he is calumniated, but he begs forgiveness." "A person who suffers bitterly when slighted or insulted should recognize from this that he still harbors the ancient serpent in his breast. If he quietly endures the insult or responds with great humility, he weakens the serpent and lessens its hold. But if he replies acrimoniously or brazenly, he gives it strength to pour its venom into his heart and to feed mercilessly on his guts. In this way the serpent becomes increasingly powerful; it destroys his soul's strength and his attempts to set himself right, compelling him to live for sin and to be completely dead to righteousness." "Abba John [the Dwarf] said, "Who sold Joseph" A brother replied saying, "It was his brethren." The old man said to him, "No, it was his humility which sold him, because he could have said, "I am their brother" and have objected, but, because he kept silence, he sold himself by his humility. It is also his humility which set him up as chief in Egypt." 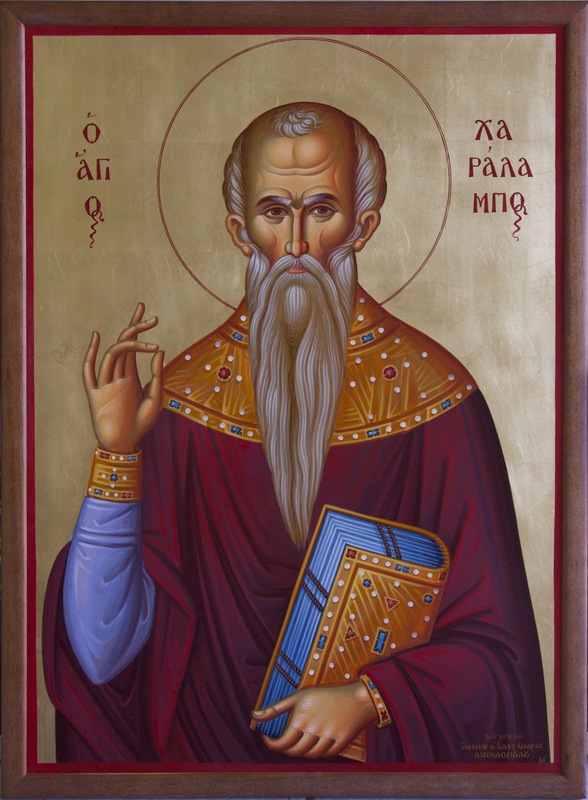 "Abba Poemen said, "As the breath which comes out of his nostrils, so does a man need humility and the fear of God." "An angel fell from heaven without any other passion except pride, and so we may ask whether it is possible to ascend to Heaven by humility alone, without any other of the virtues." 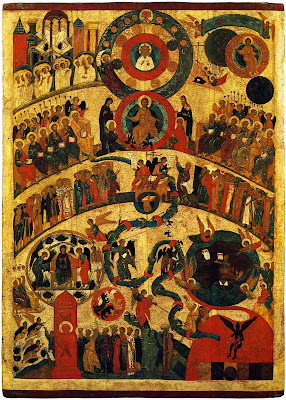 "At the Last Judgment the righteous will be recognized only by their humility and their considering themselves worthless, and not by good deeds, even if they have done them. This is the true attitude." "Behold, this is the true and the Christian humility. In this you will be able to achieve victory over every vice, by attributing to God rather than to yourself the fact that you have won." "Consider well, brethren, how great is the power of humility. Consider how great is the spiritual energy behind saying, `Pardon me.' Why is the devil called not only `enemy,' but also `adversary'? He is called `enemy' because he is a hater of man, one who hates what is good, a traitor; and `adversary,' because he always puts obstacles in the way of good. If someone wants to pray he puts obstacles in the way through evil suspicions, shameful thoughts, and spiritual torpor. If a man wants to give alms he obstructs it through avarice or procrastination. If a man wants to keep vigil he obstructs it with hesitations or laziness. In every single thing he is against us when we desire to do good. This is why he is called the enemy and the adversary and why, by lowliness, all his attacks and devices are brought to nothing." "Extirpate two thoughts within thyself: do not consider thyself worthy of anything great, and do not think that any other man is much lower than thou in worthiness. Learn humblemindedness beforehand, which the Lord commanded in word and showed forth in deed. Hence, do not expect obedience from others, but be ready for obedience thyself." "For this reason the Lord calls blessed those who are opposed to worldly possessions, saying: `Blessed are the poor in spirit, for theirs is the kingdom of heaven.' Why to the words, `Blessed are the poor,' does He add, `in spirit'? So that by this would be shown that He considers blessedness to be the humility of the soul. Why did He not say, blessed are the poor-spirited - and thus would be demonstrated the humility of thinking - but rather He says, `poor in spirit'? By this He wants to teach us that bodily poverty is also a blessedness, in that through this one can receive the kingdom of heaven, when it is done for the sake of the humility of the soul. This is the case when bodily poverty is united with the humility of the soul and when it is for the person the principle of the humility of the soul. Having called blessed `those poor in spirit,' He demonstrated in a wonderful way what are the root and cause of the visible poverty of the saints - that is, their spirit." "What made our Lord Jesus Christ lay aside his garments, gird himself with a towel, and, pouring water into a basin, begin to wash the feet of those who were below Him (John 13:4, etc. ), if not to teach us humility? For it was humility He showed us by example of what He then did. And indeed those who want to be accepted into the foremost rank cannot achieve this otherwise than through humility; for in the beginning the thing that caused downfall from heaven was a movement of pride. So, if a man lacks extreme humility, if he is not humble with all his heart, all his mind, all his spirit, all his soul and body - he will not inherit the kingdom of God." "Let all who are led by the spirit of God enter with us into this spiritual and wise assembly, holding in their spiritual hands the God-inscribed tablets of knowledge. We have come together, we have investigated, and we have probed the meaning of this precious inscription. And one man said: “It (humility) means constant oblivion of one’s achievements.” Another: “It is the acknowledgement of oneself as the last of all and the greatest sinner of all.” And another: “The mind’s recognition of one’s weakness and impotence.” Another again: “In fits of rage, it means to forestall one’s neighbor and be first to stop the quarrel.” And again another: “Recognition of Divine grace and divine compassion.” And again another: “The feeling of a contrite soul, and the renunciation of one’s own will.” But when I had listened to all this and had attentively and soberly investigated it, I found that I had not been able to attain to the blessed perception of that virtue from what had been said. 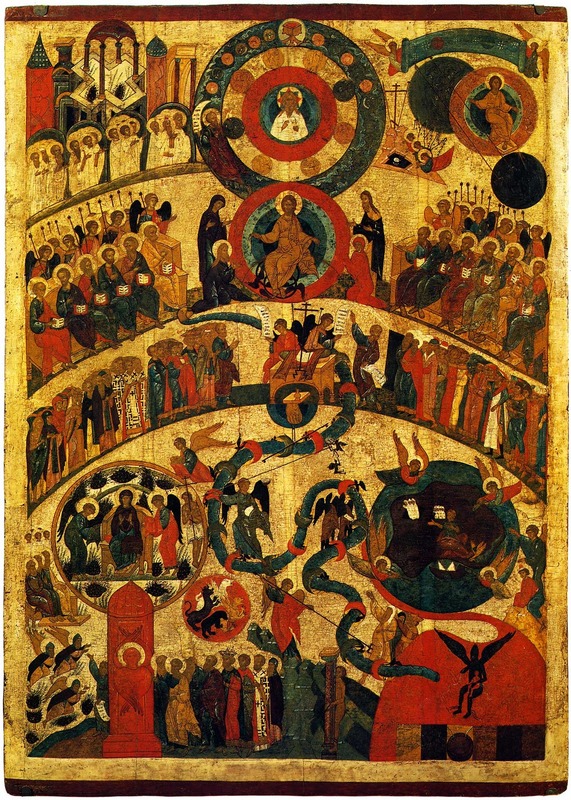 Therefore, last of all, having gathered what fell from the lips of those learned and blessed fathers as a dog gathers the crumbs that fall from the table, I too gave my definition of it and said: “Humility is a nameless grace in the soul, its name known only to those who have learned it by experience. It is unspeakable wealth, a name and gift from God, for it is said: “learn not from an angel, nor from man, nor from a book, but from Me, that is, from My indwelling, from My illumination and action in you; for I am meek and humble in heart and in thought and in spirit, and your soul shall find rest from conflicts and relief from thoughts.” (Matthew 11:29)"
"Make account that thou hast done nothing, and then thou hast done all. For if, being sinners, when we account ourselves to be what we are, we become righteous, as indeed the Publican did; how much more, when being righteous we account ourselves to be sinners." Through the prayers of our Holy Fathers, Lord Jesus Christ our God. have mercy on us and save us! Amen! “January 1931 I was hospitalized in the Polyclinic of Athens with a liver abscess. For four weeks I was tortured by a fever. Day and night I had a 38-40 degree (Celsius) fever and terrible pains. It was decided that I should have surgery. ‘There was no Priest,’ she responded. I then fell into a deep sleep. The fever began to decline from that instant. In the morning I was afebrile, totally well and without pains in the liver. In the morning the surgeon-professor N. Alivizatos and his brother Andreas (a pathologist) tested me, to get ready for the surgery. They studied and searched to find the liver abscess, but they couldn’t find it, neither did they find sclerosis or other disease of the liver (eight finger). [ούτε την σκλήρυνσιν και την διόγκωσιν (οκτώ δακτύλων) του ήπατος] The liver was normal! For the life of the Saint, see: http://full-of-grace-and-truth.blogspot.com/2010/02/st-charalambos-hieromartyr-of-magnesia.html. For two additional posts with miracles of the Saint, see: http://full-of-grace-and-truth.blogspot.com/2010/02/modern-miracles-of-st-charalambos-in.html and http://full-of-grace-and-truth.blogspot.com/2010/02/miracle-of-st-charalampos-in-filiatra.html. Your precious skull, O divine Saint, is like an alabaster box that is full and pouring out cures, like very costly fragrant oil. It wondrously perfumes the faithful, and it delivers from every evil those who approach it with faith. It exterminates foul‐smelling delusion, diseases of every kind, and the pandemic plague, and it grants good health to all, as well as peace and great mercy.